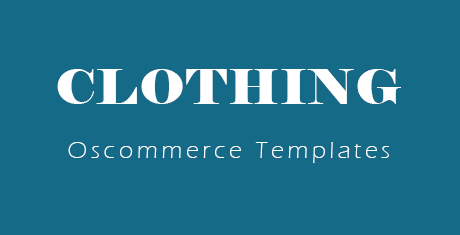 The Oscommerce clothing templates ensure that your website transcends the minimal online store label and ascends to the level of a trendy online haven of designer wear. The templates flaunt a trendy yet not gaudy minimalist interface which attracts more visitors and potential customers. These templates have a lot of other aspects which make them the best deal in the market. They feature an admin panel and are HTML5, JS coded. You can also see Wedding Website Themes & Templates. The jQuery sliders add an extra charm for the website connoisseurs. Multiple column layout actually gives the website an uncluttered look which will make it stand out in the crowd. These themes and templates are compatible with Adobe Photoshop CS+. They feature flexible adaptive layouts; they also include a full PSD template with complete and free installation. There are flexible category views which include both grid and list and alternate background options. Multiple themes extensions are available for these Oscommerce clothing templates which have further subthemes and textures that give a unique feel to your website. Drop Down Carts, Drop Down Menus, Easy Checkout options, multiple payment gateways are guaranteed features that make these templates unanimously the most suited for any ecommerce website. Multiple currencies and credit/ debit card options characterize the shopping experience in websites built from these templates. They have options for interacting with customers and FAQ sections which ensure a complete and satisfying shopping experience for the customers. They are light weight and SEO friendly, which ensures both easy loading as well as more drivers any day. If you want to make use of OsCommerce, the popular online store and ecommerce management program, you will have to use a template to make your business website. If you are a business dealing in clothes and apparel, then this trendy clothes OsCommerce template will make your website a hit. This OsCommerce clothes store template proves to be an open-source online store ecommerce solution available for use by clothing line owners. Whether you have a small collection available for sale, or an entire boutique to show off, use this premium OsCommerce clothes store template to create a massive online presence. This OsCommerce clothes store template will allow you to become one of the most well-off owners of an online clothing store. Fascinate your customers with its attractive displays, elegant fonts and sophisticated design elements. Proper placement of your products makes a huge difference in your online store’s success. If you are an online clothing store owner, you need to display your products in an organized manner, equipped with their photographs, pricing details, shipping details, descriptions, and functional link to the shopping cart and payment gateways. 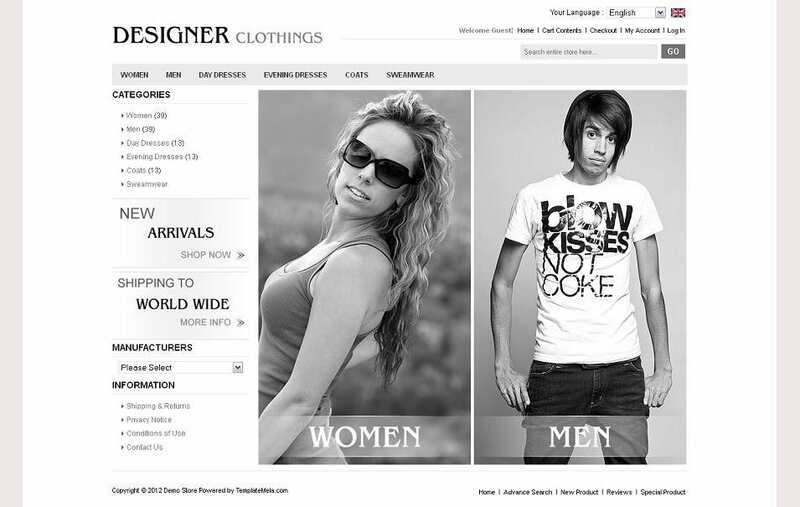 This fashion clothes online OsCommerce template allows you to make a fully-functional online clothing store. With just a number of steps, you can launch an online clothing boutique with this OsCommerce template online clothing boutique. Know your target market, source out your supplier, build your inventory and setup your website using this template. With a little bit of marketing, you will be ready to soar high in the industry. 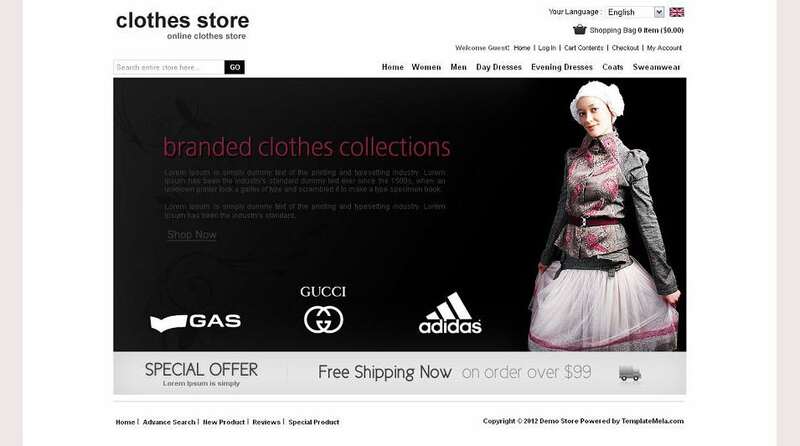 Online clothing store at it’s best, this is what you get with this e-commerce clothing store OsCommerce template online. Try this template today to fulfill your web hosting needs. With all the required features and facilities, this template is the answer to all your online store hosting and management needs. For online clothes stores, it is important to display their product images in high resolution, so that they look attractive, and convince the visitors to place their orders. With attractive theme and layout, this OsCommerce clothes store template allows you to make a nice looking website that entices customers and encourage them to buy. A fashion store online OsCommerce template makes it easy to setup a business that is dedicated to selling clothes and fashion accessories online. It will take just a few minutes to open your own online shop and start selling your clothes and fashion goods to your real customers.